Rocket Synergy evaporator controls are very easy to use - simply load your samples, select the correct method, press start and walk away. The evaporator is equipped with high performance features that prevent foaming, bumping and cross contamination. A built-in cold trap provides very high levels of solvent recovery, even with volatile organic solvents. Auto-draining, under the control of the Rocket Synergy, ensures optimal solvent recovery is maintained under all conditions. Designed to dry or concentrate up to six flasks, each containing a maximum of 450ml of solvent, or 18 ASE® vials, a Rocket Synergy requires no user intervention or attention. 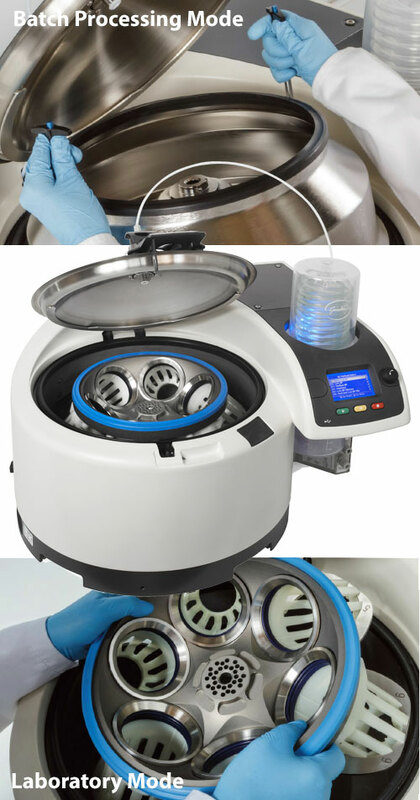 The removable flask rotor may also be replaced with a 5-litre stainless steel vessel enabling the same evaporator to batch process large sample volumes quickly and safely.